D -How can you walk with your donkey? 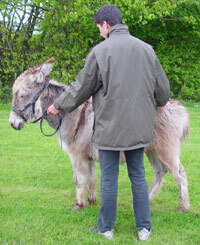 Now, you can learn how to walk with your foal. To teach him to walk with a lead, it is necessary to be always on the left side of the animal. Under no circumstances should it be able to turn its hind limbs towards you. If it does not want to walk, you should hold the lead with your left hand and give it little slaps on the croup with your right hand (often the fact of putting your hand is enough to persuade it to move). This part of the education will be very fast but will have to be maintained regularly, during its period of growth. Do not forget to stop for a few minutes during the walk. When you stop, you must insist require that your donkey remains. All these operations will be support with words. It is very important during this period of "education" is managed by only one person speaking. The donkey is very mistrustful so do not be surprised if it does not want to move in front of a manhole cover, a pedestrian crossing or a change of colour of the ground. Do not pull the lead but gain its trust, let it think and I am sure with patience, it will agree to cross this obstacle. Under no circumstances, must violence be used if the donkey does not comphy. Your donkey does not deserve this treatment and would lose its confidence. I am not a professional, but I hope this information will help you to educate your foal with confidence and that you will receive complete satisfaction both for you and your foal. As donkey lovers, we have to do everything we can if we want the post card with a donkey which walk with a carrot in front of it, published by people who do not know anything about this so familiar animal and only hold it up to ridicule.